These pictures were taken a while back for the IT girl feature but I haven’t had a chance to post them yet. This military pencil skirt was one of the items that I picked out for the feature. Unfortunately, the size 0 was too big for me. I took it to my tailor to have the waist taken it. However, she insisted on leaving the length as is. She said longer length skirts seem to be on trend this year. I wasn’t too convinced but went with it anyway. Now looking at these photos, I am having second thoughts. I am certainly not used to this length. All my pencil skirts hit above my knees. What do you think about this length? Can a petite woman pull off slightly longer skirts? 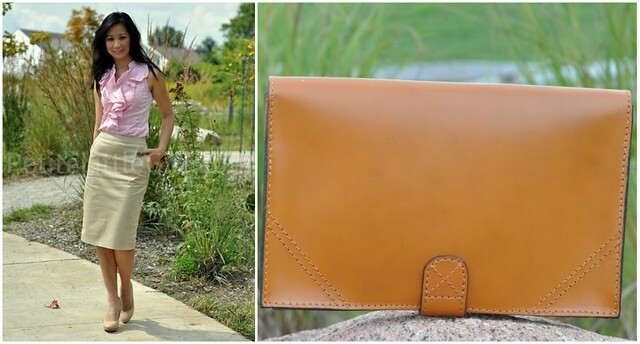 Another item on my Fall wish-list was a duo clutch/cross-body bag. I was thrilled to find a bag that met all my requirements. It is 100% leather, the color is exactly what I was looking for and it fits the bill. The strap can be easily removed to convert from a chic cross-body bag to a sleek clutch. I ordered this clutch from Zara a while back and have been carrying it almost every weekend. great outfit. I LOVE that top! I'm having the same issue with the skirts. I think we can definitely get away with wearing longer skirts with heels. It looks different, but not bad, imo. But I think with flats and longer skirts the proportions may be off or something? Not sure. I'm posting comparison pics of a longer/ shorter skirt today, and I still dont know what I think even after taking pics! In my opinion, longer skirts on a petite are not as flattering because they shorten the legs. Even if longer skirts are on trend this season, it doesn't mean we should follow it. We have to dress for our own bodies. I say you march right back to the tailor and get her to shorten the skirt so it is above the knee! Anyway, love this outfit and the color combo of the pink and burgundy and tan! I am such a sucker for ruffles. Waou this is such a casual, cool and chic outfit!! you are stunning!! Regarding your question about the length...it's a little strange that your tailor insisted on a longer specification. I honestly believe that we should dress according to what WE feel most comfortable in and what WE think looks best. Trends are just sources of inspiration for me...not guidelines. So if you feel as though it just isn't 100% right, take it back. Otherwise, rock the skirt as it is cause you look amazing! Oooooo I love the clutch Sydney - great find! I love your outfit Sydney! I think your skirt would look better if it were shorter. You're on the taller end of the petites anyways Sydney. Having a skirt a bit longer will just add variety to your closet, but if you know you wont pick it up to wear, go back for alterations. go w/what you're comfortable with. A clutch is something I'm in desperate need of. Love yours! I would probably have the skirt taken up just a tad but it looks really good on you as is, so I'd say go with personal taste. Personally I think the long line on the skirt makes your legs look long. You look classy. I really like the color of that clutch. I feel like it will pair well with anything. Then again you always look great no matter what. I love your style. Have a great weekend dear. I love the ruffle top and the whole look is very elegant without being stuffy! I see a lot of mixed opinions in your comments!! I want to hear your final verdict! Great articles. Love to stop here today. Dont miss to give us your comment into my blog. Thanks for share. Hmmm....Sydney I am like you, I usually prefer skirts that are at the knee but I do have a few skirts that cover the knee and am considering an alteration too. The thing with a past the knee skirt is that I think you can be somewhat limited in your shoe selection. It's really just stilettos because to the knee boots in my opinion looks too covered "heavy," and with short booties it really depends on the style.. I would think the length is fine but if you prefer something shorter than go for it. Your tailor is right, the below the knee length is in. Love your blog. I am 5'1" and do not blog but I have learned so much by following you and other petite fashionistas, especially the petite fashion challenges. I have a suggestion: Outerwear can be particularly challenging for petites. Why not a PFC called OUTERWEAR CHIC.. This would be helpful with the cold winter months approaching...The look could be dressy or casual and must include an outerwear garment appropriate for being outdoors in inclement weather. I love your style very much. You look very classy in this gorgeous outfit! And that clutch is awesome! @Petite in the City Hi Lor, I decided to keep the length as is just because I have many pencil skirts that are at the knee. I'd like to have something different from the rest (even though it might not be my favorite skirt to wear). Thank you so much for your opinion. @Janice Thank you so much for your kind words. I am glad you found my blog useful. I will suggest your idea to the one who will be hosting the next challenge. I think you can pull it off. Personally, I like my pencil skirts a bit longer, particularly for work, but I still keep them at least above mid-knee or just a touch longer if the style of skirt/dress calls for it. I notice that a lot of other petites prefer their skirts much shorter. It's mostly personal preference, but if you wear this skirt with heels, I don't think the proportions are off at all. LOL that skirt was to big. So sad for you, LOL Adorable outfit, I used to wear one exactly like it to work in the 80's when ruffles and pencil skirts were back in fashion for work. At that time I was a size 6 and rocked the outfit. I was wearing it one day with my waist length hair down and was offered a part in a commercial! They ended up shooting me at my ranch and paid us a fortune for the day. Pencil skirts are always classic and ladylike. I love the look!